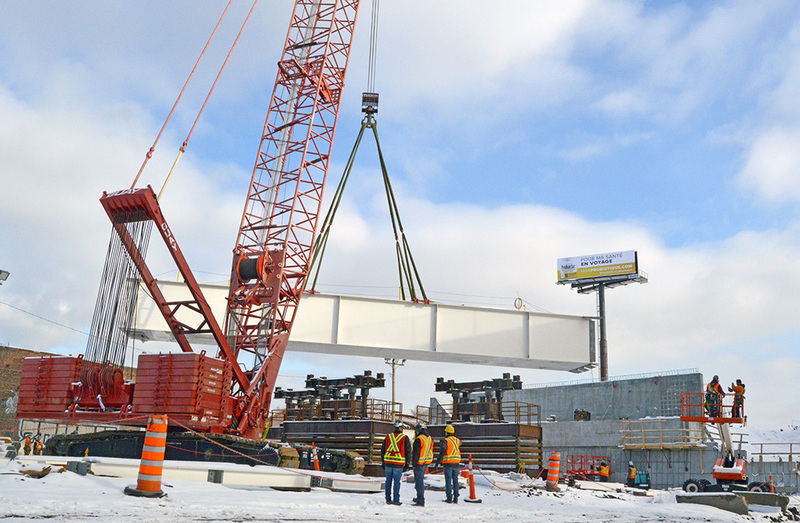 St. Lawrence Erectors proceeded to the lifting of the first girder of the new Highway 15 bridge over the Lachine Canal. This structure will be erected as part of the roadwork completed by KPH Turcot, which is responsible for the design and construction of the main infrastructures of the Turcot interchange in Montreal, QC. The mandate given to St. Lawrence Erectors includes the installation of the structural steel and the precast concrete slabs for the bridge deck, as well as the installation of the mast and cables. The work will be completed in two phases, from 2016 to 2019. It should be noted that Canam-Bridges will provide Goodco Z-Tech structural bearings and expansion joints for some bridges in this major project. Photo: KPH Turcot, consortium S.E.N.C.